Self-care is about looking after yourself in a healthy way. It can be anything from brushing your teeth, doing exercise, managing minor ailments like headaches, back pain, a cold or constipation or living with a long term health problem such as asthma or diabetes. Patients have an important part to play in managing their minor ailments and self-care can result in a better, healthier and more independent life. On average one in five visits to the surgery is for common conditions such as back ache, headaches and colds. For most people, these conditions are not serious and patients are looking to know how to relieve the situation. Patients like to know how long they may have the condition and what to do if the symptoms do not change or go away. Self-care advice can help manage many of these problems and it means that in most cases you will not need to see one of the clinicians at the surgery. Self-care for these common conditions can also help free up valuable time for our doctors and nurses, making it easier for those with more serious conditions to see the clinician. 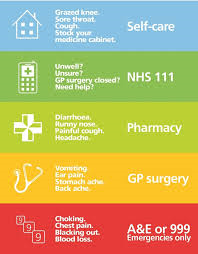 Most conditions can be treated at home with the support of information about the situation and medication which, with the support of a local pharmacist, can be purchased from a local pharmacy, again easing the pressure on NHS services. Our self-care leaflets, which have been prepared by our own clinicians, include a summary of what the condition is, how patients can help manage their condition, which over the counter products or medication may help symptoms and when it may be necessary to contact a healthcare professional. Our reception team is aware of the range of information that is available in the leaflets and if you contact us with these conditions, may direct you to these, or check you have looked at them before arranging for you to see one of the doctors or nurses. We are aware that in some instances it will be necessary and appropriate to see one of our team and the provision of these leaflets is not an obstacle to this.